Hibiscrub for Dogs contains chlorhexidine gluconate, an active ingredient that provides a broad spectrum of activity against bacteria combined with a residual action. 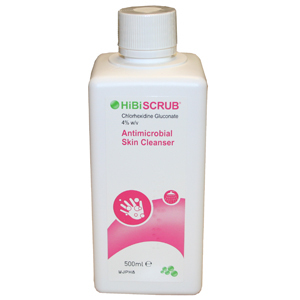 This means that, when you use Hibiscrub, not only will the product be effective against bacteria on the skin it will also continue to be active against bacteria for up to 6 hours after use. Chlorhexidine gluconate is effective against a wide range of Gram-positive and Gram-negative vegetative bacteria including MRSA and MSSA, yeasts, dermatophyte fungi and lipophilic viruses.